The first two took care of any questions I had about how to identify bullying. If a child intentionally tries to hurt another child’s feelings and does that often, it’s bullying and it needs to stop. Understanding the imbalance of power involved in bullying is, in my opinion, critical to figuring out how to prevent bullying and how to guide your child. 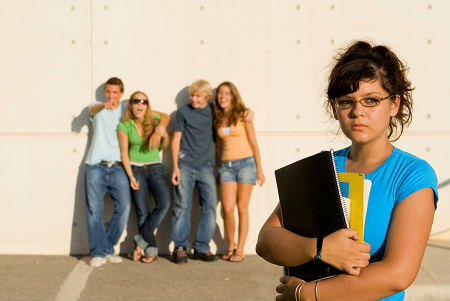 Bullying always involves one child (or group of children) demonstrating power over a “weaker” child. This imbalance of power is often established when a bully “tests the water” with a kid that responds with fear and hurt feelings. Helping our kids to be confident is important. Easier said than done, of course. There are so many factors involved in building confidence, that any bulleted list of tips would at best be too abstract or too superficial. But what we can do in that direction is to prepare our kids and give them specific advice on how to respond if they experience or witness bullying behavior. I started the conversation showing my kid this video. understand that the kids who pick on the girl are the ones who have a problem, not the girl. to resist the temptation to respond to the bullies and simply ignore them. This may win more than half the battle. Bullies feed on responses of hurt feelings. to come and talk to you. That will make him/her feel better and you can better advise on the specific situation. to support another kid that he/she witnesses being put down by pointing out to the bully that the behavior is unacceptable (you choose the words that will be natural for your child). These tips are simple but concrete and can be quite effective nipping the unwanted behavior in the bud.